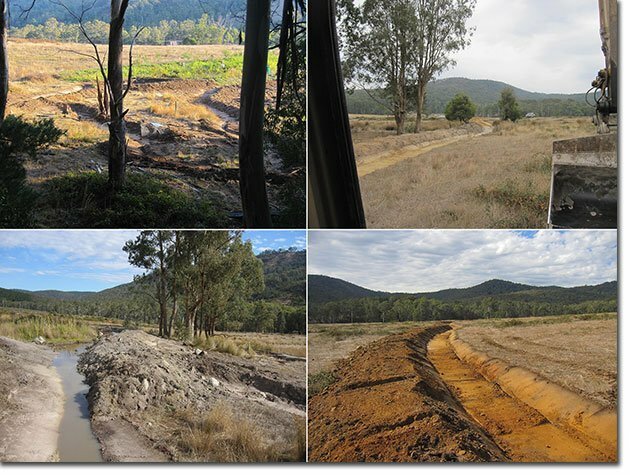 Earthworks hydrology construction is one of the first big steps in getting a property established and can be an invaluable investment into its future, so it is something you want to get right. Earthworks going wrong can be very expensive and a major setback for you and your property. We have had a bit over 12 months to watch, observe and interact with the site. We have watched how the major mainframe earthworks changed the dynamics and zoning of the site. We have the ability to flood the system to form multiple storage opportunities, all of these are gravity feed we can deluge our main crop terrace, or any of the other elements, with nutrient rich fishpond water. The retrofitted top dam spillway, flows periodically, during our winter rain season, but it is still a resource not to be missed due to its entropy. We have surveyed the contour line for this swale last year and it lined up beautifully to take the over flow of a spring feed pond 700m around the ridge. 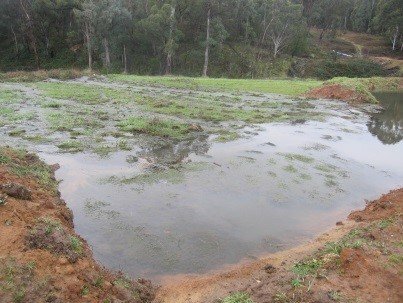 With this we have water coming in surges from the primary valley and also at the other end, we have water coming in as a constant feed from the spring feed dam/pond. In the photo below you can see 18 months of growth put on by these pioneers forming up part of the sites windbreak and food forest. 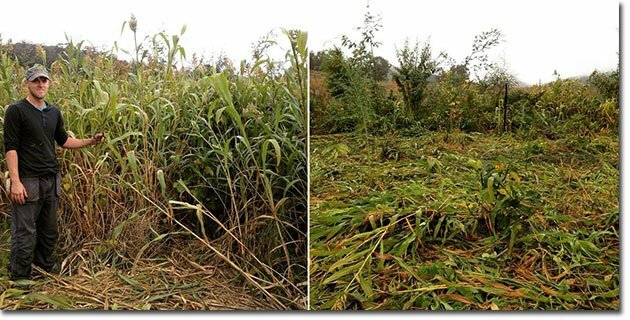 The guys have been busy chopping and dropping this summer’s cover crop, a mixture of millets, sorghums, legumes and lots of dynamic accumulators AKA weeds. – Learn the skills you need for water security on the land. 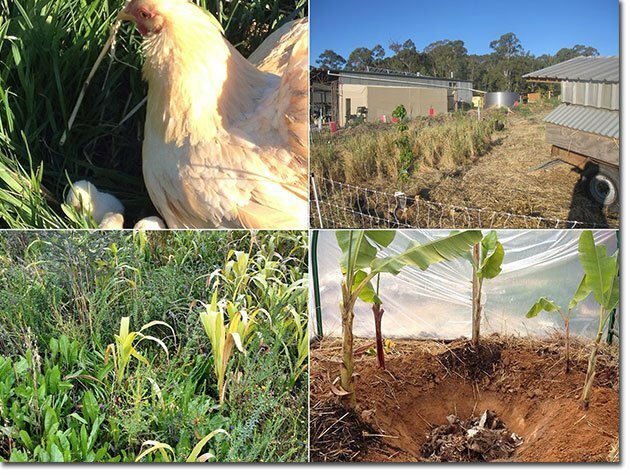 • 1st to the 5th of June 2015, Eagles Deep Permaculture Farm, Tatong Victoria, Australia. Danial Lawton of Permaculture Tools. David Spicer of Permaculture Works. Danial and David have worked in the permaculture education field for over 10 years and have seen the need become more apparent for a course to skill people on the ground, in the basics. 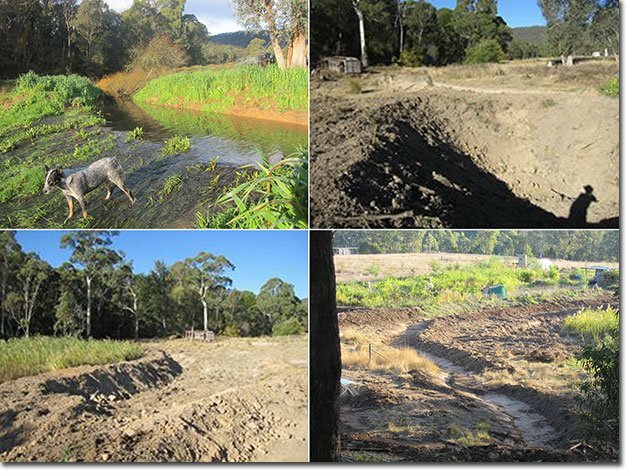 They have both worked on large permaculture earthworks hydrology projects within Australia and over seas, including both operation and instruction. Danial and David are a dynamic team with many years of knowledge and practical experience between them, and each with their own charismatic teaching style, making them a teaching duo that is a pleasure to learn from. We understand earthworks hydrology on a macro and micro level we can apply it to the urban built environments using examples from Brad Lancaster’s rain gardens. From storm water catchment, to raised beds on contour for main crop production, and water harvesting and storage on a large scale for farm uses. Water and the water’s edge is 30 times more productive than land, having the classic edge effect. When thinking about earthworks design the aim is to keep water as high and as long in distance and time in the landscape as possible. Earth works are major elements in design; we are always starting with water in any design. To book on this course or for more information, please click here.